Nina Van Der Westhuizen was born and grew up in Robertson in the Little Karoo, South Africa. 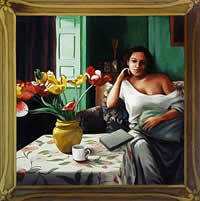 After school Nina Van Der Westhuizen obtained a BA Degree in Art from the University of Stellenbosch. She taught art for five years before starting to paint full time in 1983. In 1986 Nina Van Der Westhuizen had her first solo exhibition at the Dorp Street Gallery in Stellenbosch. In 1991 she moved to Darling, about 70 kilometers from Cape Town, where Nina Van Der Westhuizen stays with her husband, daughter and pets. 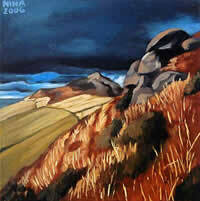 Since 1986 Nina Van Der Westhuizen has had several exhibitions, but most of her work comes from commissions. Her paintings can be found in private collections all over the world. Nina Van Der Westhuizen was invited to exhibit at the Florence Biennale in Italy at the end of 2005. Nina Van Der Westhuizen works in oil on canvas and paints the frames onto the canvas. Her subject matter varies from still life to wild animals, landscape and people. She is influenced by the vibrancy, adventure and magic of Africa!